How can multiple people simultaneously collaborate on creative ventures with minimal instruction or technical know-how? Our project has been through various transformations. We began with the idea of transforming physical structures into 3D digital renderings using custom blocks with RFID tracking. Through the design process, we began to rethink our approach to implementation and our end goal. We ended up pivoting and creating Forma, which uses physical blocks to create a digital 2D pattern or mural. These blocks come in various shapes and colors, and include four layers of laser cut acrylic material: the bottom layer is a two tone acrylic sheet with a unique MultiTaction marker code etched into the bottom; then two layers of white acrylic to provide more bulk to the blocks; and finally a colorful acrylic topper that will match the digital representation of the shape on the screen. The codes on the bottom allow the blocks to interact with the the MutliTaction touch table. 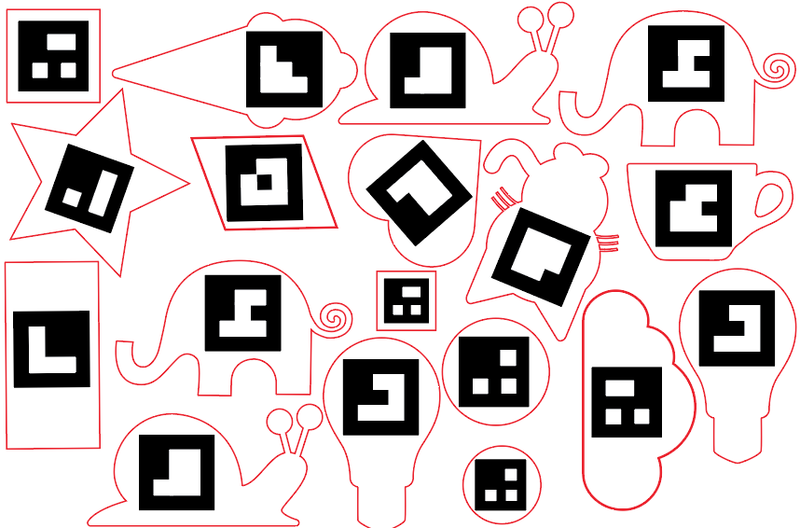 Each marker is associated with a digital .png file that corresponds with the physical block. You can find our code on GitHub here. Implement functionality for increased customization of shapes, including changing shape colors, and sizes, and pattern. Explore the scale on which our project can function, possibly creating extensions for multiple tables and increased collaboration.